In my research, I use computer simulations to understand the interior and evolution of giant planets. Materials in planetary interiors are exposed to extreme temperature and pressure conditions that cannot yet be reached with laboratory experiments. Instead we rely on highly accurate first-principles computer simulations techniques. With these methods, we recently explained why neon is depleted in Jupiter's atmosphere and provided strong, though indirect evidence for helium rain to occur in giant planets. 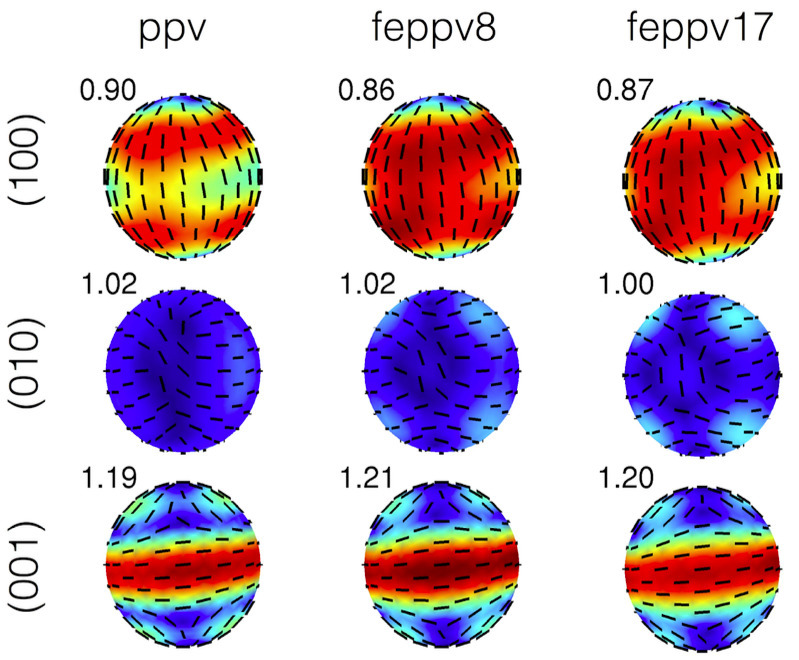 Our recent simulations predict core erosion to occur in gas giant planets. Furthermore I study materials in the deep mantle of our planet and compare my results with static and dynamic high pressure experiments. 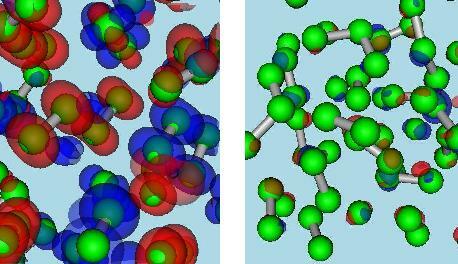 In some cases, computer simulations provide new insight into properties of materials that cannot be obtained with experiments. In other cases we use them to make predictions for the state of matter at these extreme pressures. Recent examples include fluid helium and water ice at megabar pressures. My background is in the field of theoretical condensed matter physics and I am interested in theory and simulation of novel materials under extreme conditions. I use a variety of first-principles simulation methods including path integral Monte Carlo, groundstate quantum Monte Carlo, and density functional molecular dynamics. Hugh F. Wilson, associate specialist, now at CSIRO in Melbourne. Felipe Gonzalez, visiting Ph.D. student from the Universidad de Chile. 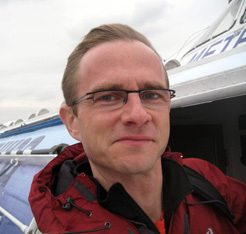 Stephen Stackhouse, now Lecturer at the University of Leeds. Saad Khairallah, now at Lawrence Livermore National Laboratory. Mike Wong, UCB undergraduate student, now PhD student at Caltech. Benjamin Sherman, visited from CSUN in 2010 and 2011. In the fall of 2008, I introduced EPS 109 "Computer Simulations in Earth and Planetary Science" as a new course. An introduction to computer simulation and data analysis methods is given and students learn to write programs with Jupyter notebooks. Have a look the animations that the students made during the 2008, 2009, 2011, 2012, 2013, 2014, 2015, 2016, and 2018 classes. In spring of 2011, Dino Bellugi and I introduced the graduate class EPS 209 "Matlab Applications in Earth Science". Here is a complication of the final projects. I teach the course C12 "The Planets". A tour of the mysteries and inner workings of our solar system is presented. The class has over 200 students and is directed at nonscience majors. Here are some pictures from our class room demonstrations in 2010 and 2012. This course is also offered as an online summer class W12. Here are three examples from our series of recorded lectures: a course introduction, one on the Kepler mission, and one on meteorites. My experiences teaching online are described in an article for the EPS alumni report in 2010. Here are some pictures from my presentations at UC Berkeley's CalDay events in 2010, 2013, and 2019. I also participated in a field trip to Yosemite National Park. Currently we have two open postdoc positions, one in planetary science and one in physics at extreme conditions. Applications will be reviewed starting May 10 until the two positions have been filled. To apply please follow this link..
Alternatively, you may be able to work with me by my taking advantage of opportunities in Astronomy. Ph.D. applicants interested in this research should apply to the department of Earth and Planetary science or alternatively to the department of Astronomy. The deadline is late in December every year. Applicants are encouraged to contact me in advance to discuss mutual interests and specific research projects. Planet Saturn was born naked but today it has rings and winds 9000 km deep. Gravity coefficients of Saturn and Jupiter. Varying rotation frequency in Saturn's interior. This work is based on a collaborative article published in Science that is entitled "Measurement and implications of Saturn's gravity field and ring mass". For everyone to use, here are some slides in PPTX and PDF formats as well four graphics files that I prepared. Robert Sanders prepared this press release. Among the news coverage for this work, this Russian report stood out by explaining we had determined when Saturn became "The Lord of the Rings". Also here is an interview on NPR's radio show Science Friday about this work. The winds in Saturn's atmosphere are massive and at least 9000 km deep: We had prepared a suite of models for Saturn's interior that included different core masses and amounts of helium rain. We calculated the expected gravity field and were pretty sure Saturn's gravity coefficent J8 would fall between -9 and -8 x 10-6. We were completely surprised when the Cassini spacecraft measured J8 to be -14 x 10-6, which implied something important was missing from all models that we had constructed. After we added deep and massive winds to our interior models we were able to match all gravity coefficients. The winds need to be at least 9000 km deep. The winds in Saturn atmosphere had been observed before but no one had assumed they would reach that deep. The first evidence of very deep winds in giant planets only came late last year when measurements of the Juno spacecraft predicted the winds on Jupiter to be between 3000 and 5000 km deep. Saturn's rings are young and only formed 10-100 million years ago: When I admired Saturn's spectacular rings, I naively assumed they were as old as the planet itself (4.5 billion years). The first gravity measurement of the ring mass now tells us otherwise. They contain only about 0.4 Mimas masses (2000 Mimas masses = 1 Earth moon) worth of material, which points to a surprisingly young ring age of only between 10 and 100 million years. Before that Saturn presumably did not have any rings. (On our slides, we explain how one relates ring mass and age.) This tells us a dramatic event must have occurred near Saturn in our recent solar system history. 100 million years ago, the dinosaurs still roamed on Earth. They disappeared when a giant impact occured near the Yucatan peninsula 65 million years ago. Now we have evidence that a drastic event occurred near the Saturnian system that produced a gazillion pieces of icy rubble that make up the rings today. This suggests that our solar system is not such a stable and happy place as one might think. We assume the rings are either the leftover debris from a comet that was tidally disrupted by Saturn's extreme gravity just like the Shoemaker-Levy comet was pulled apart by Jupiter. Alternatively Saturn originally had multiple satellites, their orbits become unstable, and it came to a gigantic collision. We cannot tell which scenario is more likely but we do know something drastic must have happened in the Saturnian system fairly recently by astronomical standards. 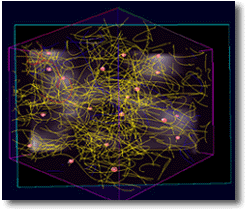 Different paths that enter into PIMC simulations of just two particles. 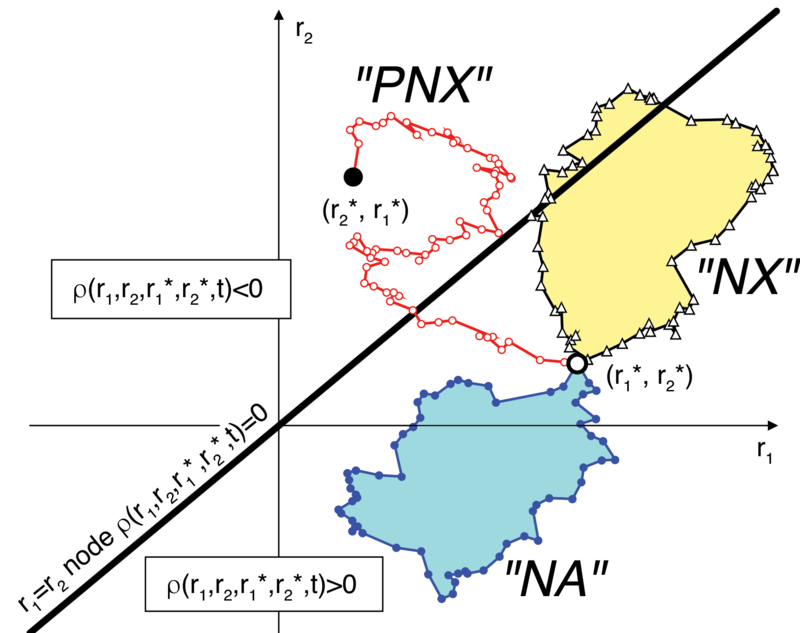 Node-avoiding (NA), node-crossing (NX) as well as permuting, node-crossing (PNX) paths are illustrated. The diagonal black line denotes the node the density matrix, ρ=0. Modeling the behavior of interacting quantum systems on a classical computer is challenging. Here we the Feynman's path integral method to map a system of quantum particles onto a system of classical paths. While most thermodynamic properties can be derived from simulations of closed paths, the computation of the momentum distribution requires open paths. In this article, we compute the momentum distribution of the homogeneous electron gas with path integral Monte Carlo (PIMC) simulations. Since thsi is a fermionic system, we employed the restricted path approach to deal with the fermion sign problem. In the restricted PIMC method, only node-avoiding (NA) paths contribute. For two particles, the nodal restriction prohibits all permutations. However, if simulations with the direct fermion method are performed no restrictions are applied. Nonpermuting paths that cross the nodes (NX) and those that avoid it (NA) both enter with a positive sign. Permuting paths (PNX) are now permitted and enter with a negative weight given by the (-1)P factor. 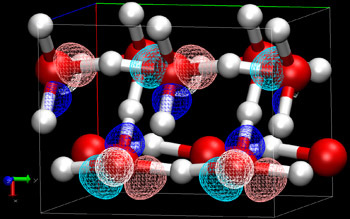 Crystal structure of our new water-salt compound that we predict to form at high pressure. The yellow, green, red, and light spheres denote the positions of the chlorine, sodium, oxygen, and hydrogen atoms. The small arrows denote the dipole of the water molecules that cancel each other out. We developed a new symmetry-driven structure search (SYDSS) algorithm to predict novel materials with ab initio simulations. 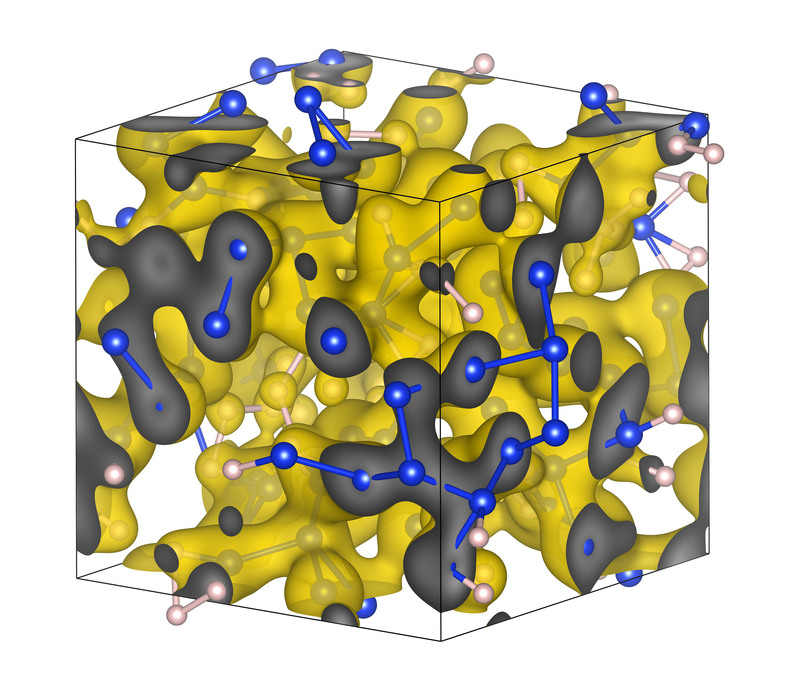 In our recent article, we predict water and salt form a novel compound at high pressure. While at ambient conditions, water can only incorporate a modest amount of salt, we predict that both materials form a novel 1:1 stoichiometric H2O-NaCl compound at high pressure. It is well-known that high pressure changes the crystal structure of materials, novel materials may form, and immiscible compounds can become miscible. In the same article, we also predict two unusual carbon oxides, C2O and C4O, to form while at ambient pressures, only CO2 and CO are known to exist. 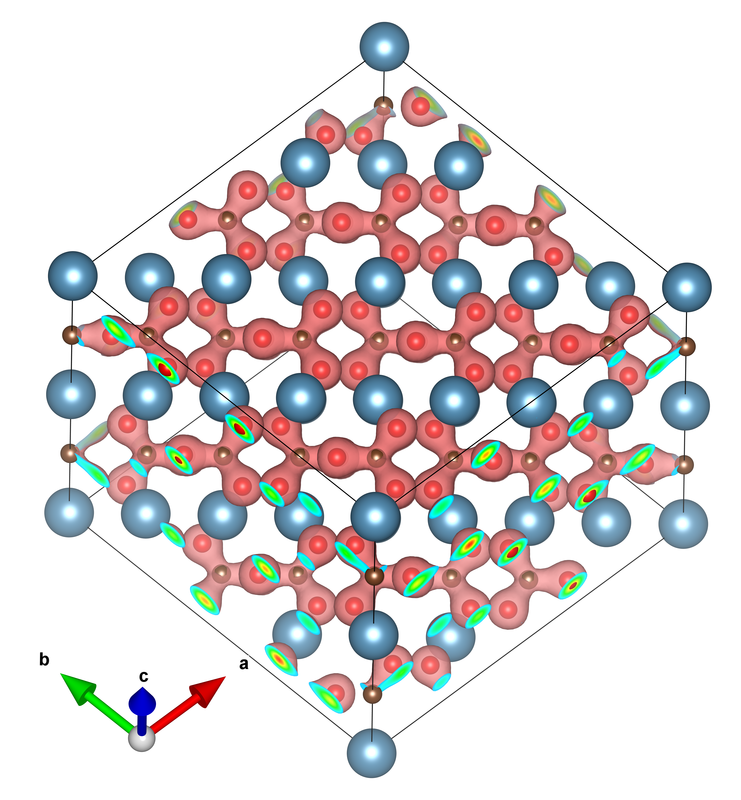 Solid silicates (blue line) are semi-conductors that have excitation gap (green region). 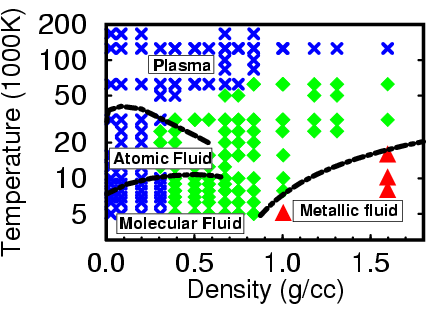 Liquid silicates (red line) have no gap and are thus semi-metals. They conduct electricity reasonably well. With the Kepler satellite, thousands of new exoplanets were discovered. Many of them have been described as Super-Earths since they are larger than Earth but also have a rocky composition. Their interiors are much hotter than Earth's and part of their mantles are likely to be liquid. In our recent article, we showed that the electrical conductvity of liquid mantles are sufficiently high so that Super-Earths can generate magnetic fields with their mantles. This is a new regime for the generation of planetary magnetic fields. Our magnetic field on Earth is generated in the liquid outer iron core. On Jupiter, it arises from the convection of liquid metallic hydrogen. On Uranus and Neptune, it is assumed to be generated in the ice layers. Now we have added molten rocks to this diverse list of field generating materials. This also implies that the magma ocean that existed on the early Earth generated a magnetic field. T-P path of experiments with multiple intermediate shocks. 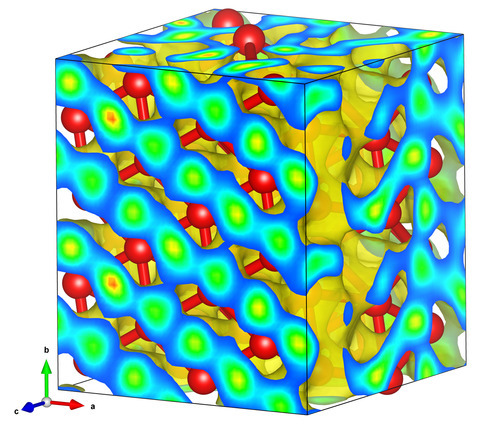 Valence band gap predicted with our DFT-MD simulations and two semi-analytical models. In our recent article, we studied aluminum at extreme pressure and temperature conditions with path integral Monte Carlo and density functional molecular dynamics simulations. We derive the equation of state and various electronic properties. In laboratory experiments, one typically uses shock waves to reach such extreme conditions. The material becomes very hot if just a single shock is employed. The graph on the left illustrates that comparatively low, nearly isentropic temperature conditions can be reached when a number of smaller shocks are employed instead. Aluminum is metal. However, there is gap in the electronic density of states between the 2p and the conduction band. 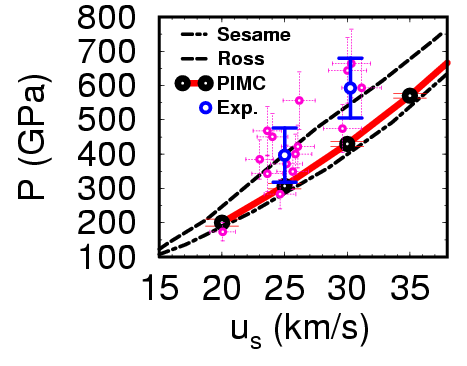 This gap is expected to close at very high density when the bound 2p state merge with the free particle states. The two semi-analytical theories (Stewart-Pyatt and REODP) predict the gap to close rather rapidly with increasing compression. 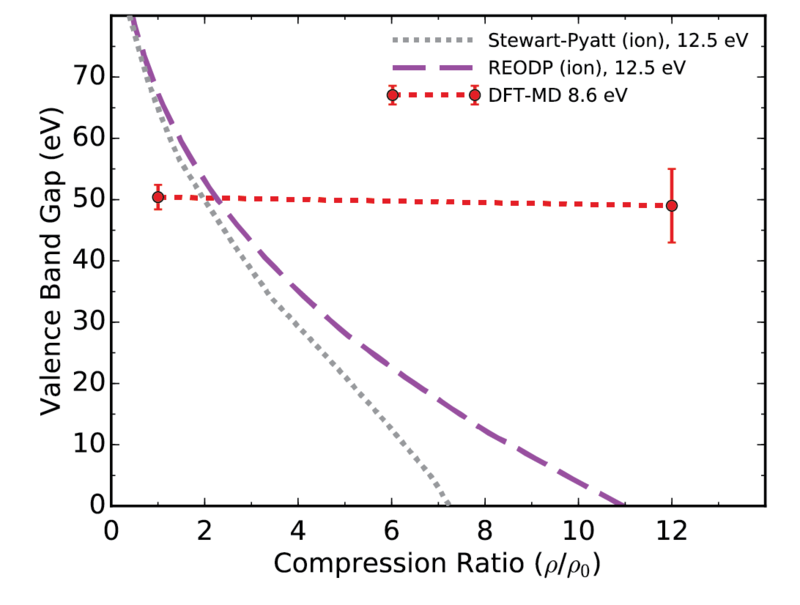 Conversely, with my DFT-MD simulations, we find the magnitude of the gap hardly changes up to 12-fold compression. This stark disagreement is subject to further investigations. 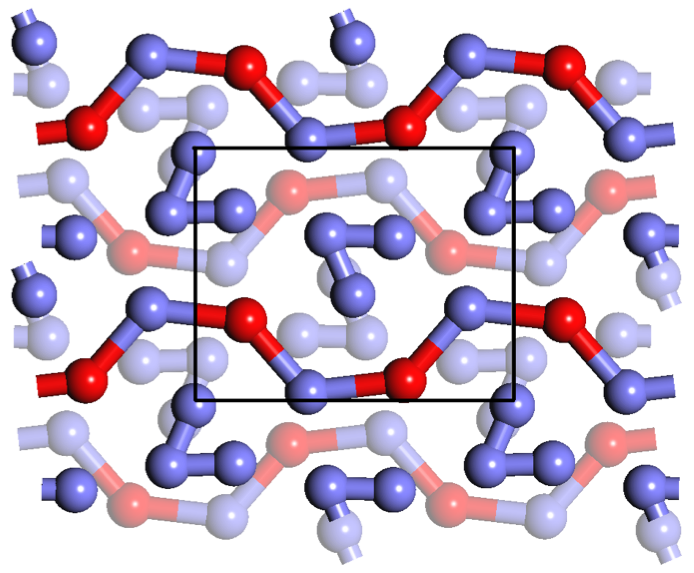 Superionic water in novel P21/c structure. Deep in the interior of Uranus and Neptune, water has been predicted to occur in a novel, superionic form. 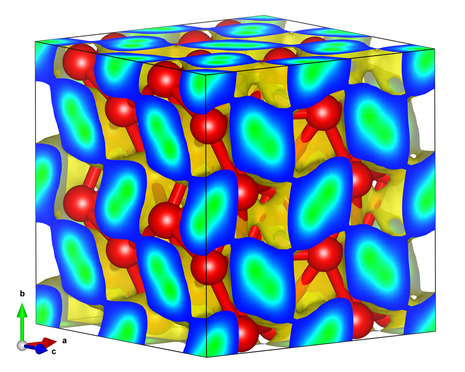 In our latest article, we use ab initio Gibbs free energy calculations to demonstrate that superionic water changes from face-centered cubic form to a novel structure with P21/c symmetry at 23 Mbar. At even higher pressure of 69 Mbar, superionic water is no longer stable. It decomposes into two superionic H2O2 and H9O4 compounds. Polymeric CH structure at high pressure and temperature. The blue and white spheres denote the C and H atoms, respectively. The yellow isosurface denotes the electron density. Density-temperature conditions of our simulations. The black and red triangles label our PIMC and DFT-MD simulations, respectively. In these two articles, (a) and (b), we investigate CH pastic materials at extreme pressure-temperature conditions that are relevant to inertial confinement fusion experiments. Such hydrocarbon plasmas are of broad interest to laser shock experimentalists, high energy density physicists, and astrophysicists. Our project has been support by a Bluewaters computer time allocation. Jupiter interior model with a dilute core. Most models for Jupiter's formation assume it started with a dense core of rock and ice. Once that reached a critical mass of ~10 Earth masses, the run-away accretion of hydrogen-helium gas set in, which lasted until Jupiter had consumed all the gas in its vicinity, leading to a giant planet of 318 Earth masses. While the temperature and pressure conditions in the planet's center reached ~16000 K and ~40 Mbar, the fate of the core remains ill-understood. Typical core materials like water ice, MgO, SiO2, and iron are all soluable in hydrogen, which assumes a metallic state under these extreme conditions. It is not unclear, however, if there was sufficent convective energy in Jupiter's early history to spread out the heavy core materials against the forces of gravity. Here we construct a series of models for Jupiter's interior in order to match the recent gravity measurments of the Juno spacecraft. We demonstrate models with a dilute core match the observations better lending support to the hypothesis that heavy material in Jupiter's core have been redistributed over a substantial fraction of the planet's radius. Different terms ranging diffuse, dilute, expanded and even fuzzy have been invoked to describe such a core. A Jupiter model with a dilute core is shown on the left. Calcite I crystal structure. The blue, brown, and red spheres denote the Ca, C and O ions respectively. 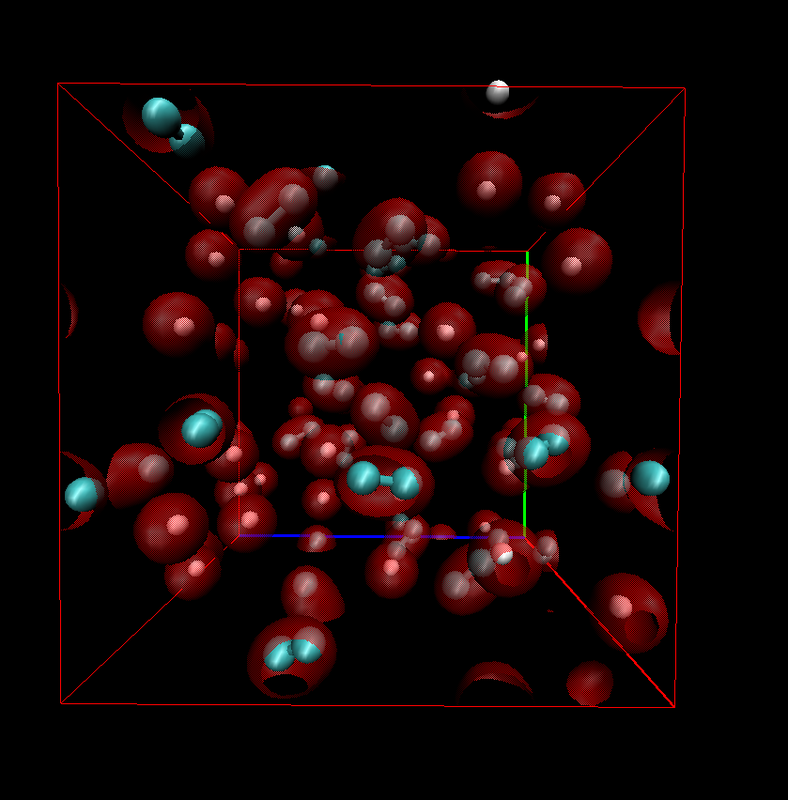 The red isosurface denotes the electron density. Calcite V propeller phase. The yellow isosurface denotes the density of oxygen ions that emerges from the propeller rotation of the carbonate CO32- ions. With ab initio computer simulations, we studied the unusual propeller motion of the carbonate CO32- ions in phase V of calcite (CaCO3). We found that the ions perform a tumbling motion and instead of rotating like a perfectly mounted propeller. We also demonstrated that this phase is denser than the liquid implying a negative slope of the melting line. Computer simulation of a hot, dense mixture of hydrogen (white), helium (green) and iron (yellow spheres) atoms. Giant planets are primarily composed of hydrogen and helium but they also contain a small amount of heavier elements. In the atmosphere they make up less than 3% by mass but they dominate the planets opacity. Without their presence we would be able to see through Jupiter's molecular layer and directly observe the planet's metallic interior where its magnetic field is generated. Most scientists assume Jupiter has a core composed of heavy elements. Its size and composition is uncertain but we estimated its mass to be worth 12 Earth masses. The total heavy element fraction in the planet could be as high as 7%. In this article, Francois Soubiran investigates the properties of various heavy elements in giant planet interiors. The equation of state is computed for C, N, O, Si, Fe, MgO and SiO2 mixed with hydrogen and helium. Effective mixing rules are derived to make models of giant planet interiors more accurate. Review article entitled "Understanding Jupiter's Interior"
This article provides an overview of how models of giant planet interiors are constructed. We review measurements from past space missions that provide constraints for the interior structure of Jupiter. We discuss typical three-layer interior models that consist of a dense central core and an inner metallic and an outer molecular hydrogen-helium layer. These models rely heavily on experiments, analytical theory, and first-principle computer simulations of hydrogen and helium to understand their behavior up to the extreme pressures ~10 Mbar and temperatures ~10,000 K. We review the various equations of state used in Jupiter models and compare them with shock wave experiments. We discuss the possibility of helium rain, core erosion and double diffusive convection may have important consequences for the structure and evolution of giant planets. The diagram on the left shows the radius and fractional mass as function of mass for a typical model. The color label various layers. Temperature-pressure profiles for Jupiter's interior during the planet's evolution. When the Juno spacecraft arrives at Jupiter in July of this year, it will map out the planet's gravity field with unprecedented precision. What can we expect to learn about Jupiter's interior? Based on earlier measurements and on results from ab initio computer simulations of mixtures of hydrogen, helium, and some heavier elements, Bill Hubbard and I put together a number of different interior models (ApJ, 2016) . We predict a massive core of 12 Earth masses consistent with earlier models. Furthermore, we predict that helium rain has occurred on this planet for some time, which is a direct consequence of combining the measurements of the Galileo entry probe with results from ab initio calculations for the hydrogen-helium immiscibility and adiabats. What is the Composition of the Deep Earth Mantle? Shear wave splitting strength. Despite a wealth of seismic observations, many questions about the compositions of the Earth's mantle have remained unanswered. In a recent study (EPSL, 2016) lead by Shuai Zhang, we show that the assumption of a pyrolitic composition for the deep Earth is in good agreement with the preliminary reference Earth model (PREM), which is a 1D seismological representation of the Earth's interior. In collaboration with Tao Liu and Stephen Stackhouse (Leeds U.) and Sanne Cottaar (Cambridge U. ), we performed ab initio molecular dynamics to calculate the elastic and seismic properties of pure, Fe3+ and Fe2+, and Al3+ bearing MgSiO3 perovskite and post-perovskite over a wide range of pressures, temperatures, and Fe/Al compositions. Nucleus-electron correlation functions. In our recent publication in Physical Review Letters, Kevin Driver and I extended the applicability range of fermionic path integral Monte Carlo simulations to heavier elements and lower temperatures by introducing various localized nodal surfaces. Hartree-Fock nodes yield the most accurate prediction for pressure and internal energy that we combine with the results from density functional molecular dynamics simulations to obtain a consistent equation of state for hot, dense silicon under plasma conditions and in the regime of warm dense matter (2.3-18.6 g/cc, 5x105 - 1.3x108K). The shock Hugoniot curve is derived and the structure of the fluid is characterized with pair correlation functions. On the left, we estimate the degree of ionization by comparing the integrated nucleus-electron pair correlation functions from PIMC (symbols) with results for isolated atoms (black dashed lines). Phase diagram of nitrogen. 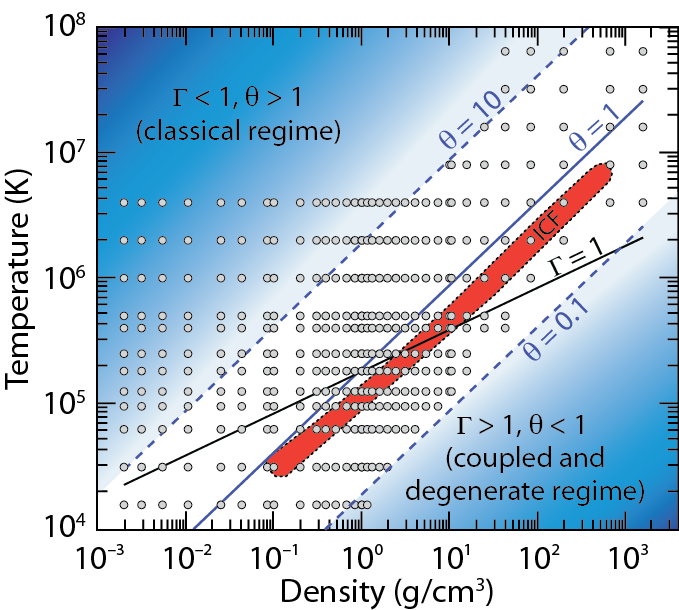 In two articles, Kevin Driver, Francois Soubiran, Shuai Zhang, and I combine path integral Monte Carlo simulations and density functional molecular dynamics to study oxygen and nitrogen in the regime of warm dense matter. We characterize both material at extreme pressure and temperature conditions that exist in stellar interiors and can be probed with shock wave experiments. We use pair correlation functions and the electronic density of states to describe changes in the structure of the plasma. We compute the shock Hugoniot curves to compare with laboratory experiments. 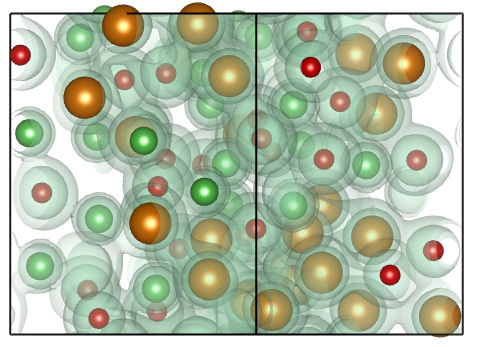 For nitrogen, we characterize the regime of molecular dissociation that leads to a region of dP/dT<0 at high pressure, which is shown in green in the phase diagram on the left. Do Uranus and Neptune have oceans? Simulation of a H2-H2O mixture. Ice giant planets are typically assumed to have a hydrogen-rich atmosphere, an intermediate ice layer, and a rocky core. Such three-layer models satisfy the observational constraints for Uranus and Neptune. However, it remains unclear whether these planets have oceans, which would imply the existence of a sharp boundary between the hydrogen and water layers. Alternatively, the density and the water contents of the atmosphere could increase gradually. Recent laboratory experiments by Bali at el. (2013) favored the ocean hypothesis. 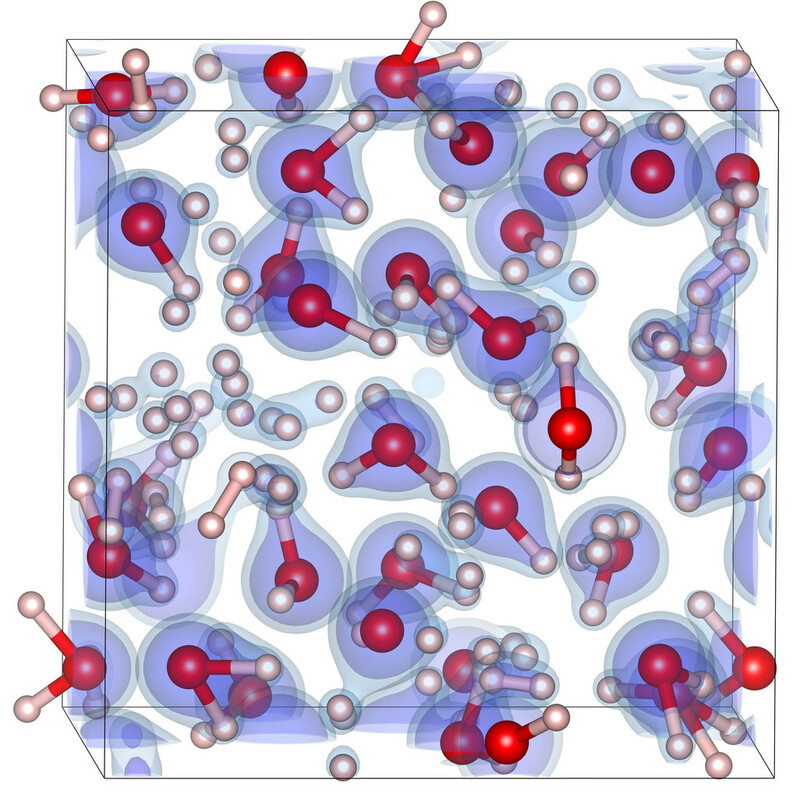 In our ApJ article, Francois Soubiran and I used ab initio computer simulations to determine whether H2 and H2O are missible at high pressure. Contrary to the experimental predictions, we find that both materials are fully miscible under ice giant interior conditions. We predict that these planets can only have oceans if icy building blocks were delivered before the gas was accreted during planet formation. Do iron and rocks become miscible in the interiors of terrestrial planets? Simulation of a liquid iron-MgO mixture. The brown, green, and red spheres denote Fe, Mg, and O atoms. The grey surfaces show the electron density. All known terrestrial planets have a separate iron core and a rocky mantle because metallic iron has a low solubility in rocky materials under typical pressure-temperature conditions in the planetary interiors. However, at sufficiently high temperatures, all materials eventually become miscible, even oil and water. In our recent article, Sean Wahl and I use ab initio computer simulations to determine what temperature would be required for iron and MgO to become miscible in all proportions. We find that the required temperature rises from 4000 to 10,000 K as the pressure is increased from 0 to 500 GPa. Such extreme conditions can be reached during a giant impact on a terrestral planet, implying that not all iron would settle into core during such an event. for giant exoplanets. Our new simulation data are shown in red. Using density functional molecular dynamics simulations, we determine the equation of state for hydrogen-helium mixtures spanning density-temperature conditions typical of giant planet interiors. In our manuscript, a comprehensive equation of state table with 391 density-temperature points is constructed and the results are presented in form of two-dimensional free energy fit for interpolation. 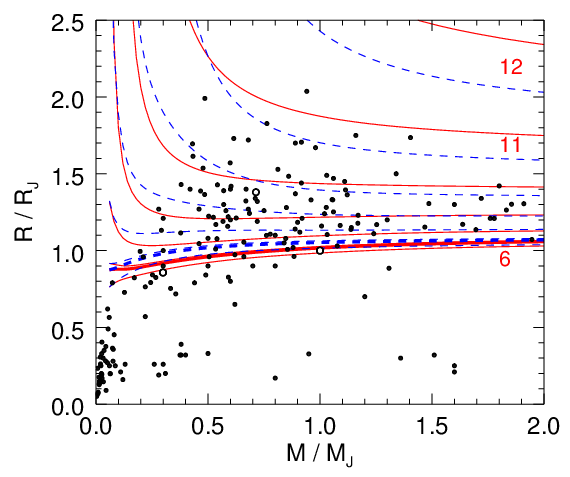 We present a revision to the mass-radius relationship which makes the hottest exoplanets increase in radius by ~0.2 Jupiter radii at fixed entropy and for masses greater than ~0.5 Jupiter mass. This change is large enough to have possible implications for some discrepant "inflated giant exoplanets". Our full EOS table as well as our free energy interpolation code has just been made available here. 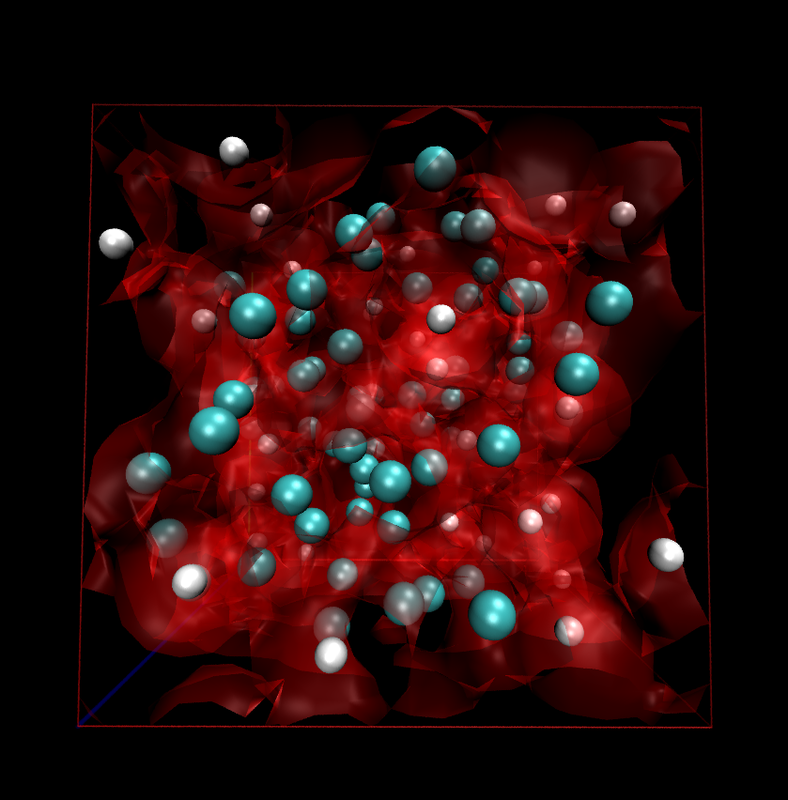 Oxygen (red) and hydrogen (blue) atoms in the new H4O structure. Water and hydrogen at high pressure make up a substantial fraction of the interiors of giant planets. Using ab initio random structure search methods we investigate the ground-state crystal structures of water, hydrogen, and hydrogen-oxygen compounds. Here, we find that, at pressures beyond 14 Mbar, excess hydrogen is incorporated into the ice phase to form a novel structure with H4O stoichiometry. We also predict two new ground state structures of water ice with P21/m and I4/mmm symmetry to form at 135 and 330 Mbar, respectively. Here is a slide that summarizes the seven new high pressure ice phases that were recently predicted with ab initio calculations. The four snapshots from our ab initio simulations show how methane gas at high pressure and temperature forms long hydrocarbon chains. The blue and white spheres denotes the carbon (C) and hydrogen atoms, respectively. The red lines indicate the C-C bonds that increase from left to right. In our recent paper, we show that the resulting polymeric state is metallic and exists in the interiors of Uranus and Neptune. We also predict how such a transformation on the atomistic level can be identified with macroscopic shock wave experiments. Path integral Monte Carlo simulations are a powerful tool to study quantum systems at high temperature but applications to elements beyond hydrogen and helium with core electrons have so far not been possible. In our recent PRL article, Kevin Driver and I develop a new all-electron path integral Monte Carlo technique with free-particle nodes for warm dense matter and apply it to water and carbon plasmas. Our results for pressures, internal energies, and pair correlation functions compare well with density functional molecular dynamics at temperatures of (2.5-7.5)·105K. Both methods together form a coherent equation of state over a density-temperature range of 3-12 g/cc and 104-109 K.
Gas giants are believed to form by the accretion of hydrogen-helium gas around an initial protocore of rock and ice. 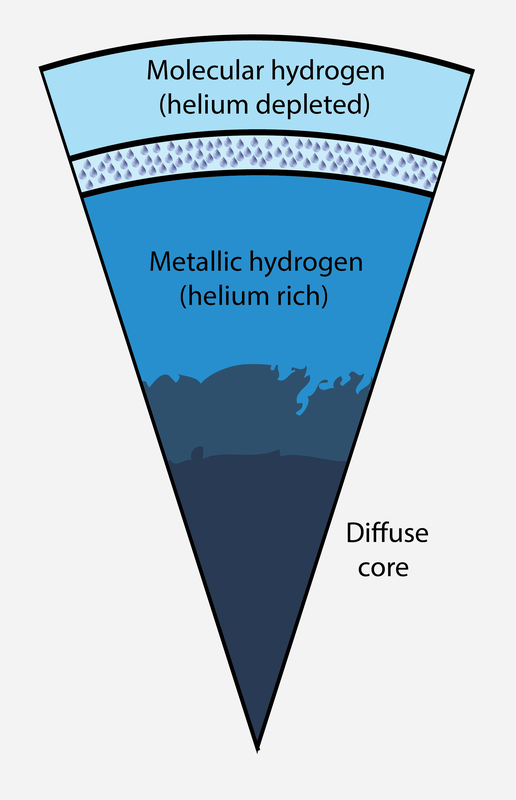 The question of whether the rocky parts of the core dissolve into the layer of metallic fluid hydrogen following formation has significant implications for planetary structure and evolution. 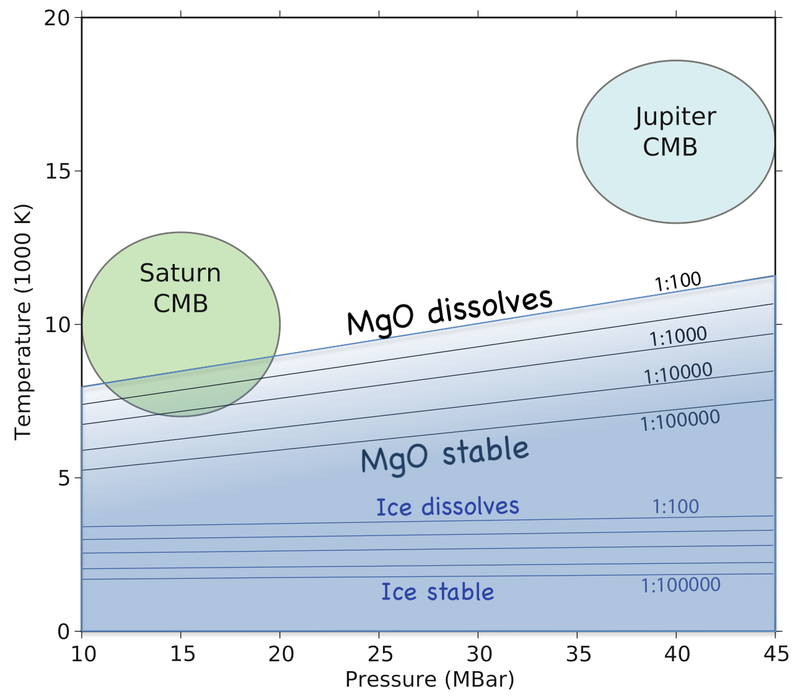 Here we use ab initio calculations to study rock solubility in fluid hydrogen, choosing magnesium oxide as a representative example of planetary rocky materials, and find MgO to be highly soluble in H for temperatures in excess of approximately 10000 K, implying significant redistribution of rocky core material in Jupiter and larger exoplanets. Using path integral Monte Carlo simulations we have derived an equation of state (EOS) table for deuterium that covers typical intertial confinement fusion conditions at densities ranging from 0.002 to 1596 g/cm3 and temperatures of 1.35 eV ~ 5.5 keV. The small grey circles in the diagram on the left indicate the temperature-density conditions of our simulations. The EOS and related results are summarized in an article that has been published in Physical Review B. The bonding properties of water ice at high pressure are studied in this article. 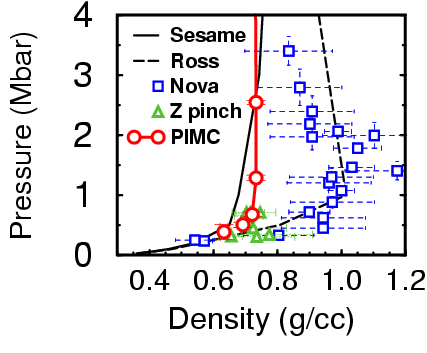 By comparing the Wannier orbitals in the Pnma structure (shown in the image on the left), one can tell that they differ substantially from the sp3 hybridization in the ice X phase at lower pressures. Most strikingly, the white orbitals are not aligned with any hydrogen bond. Simulations predict water ice to be unstable above 3000 Kelvin when exposed to metallic hydrogen The four giant planets in our solar system grow so large because icy comets made their cores grow much faster than those of terrestrial planets, which enabled them to accrete large amounts of gas. 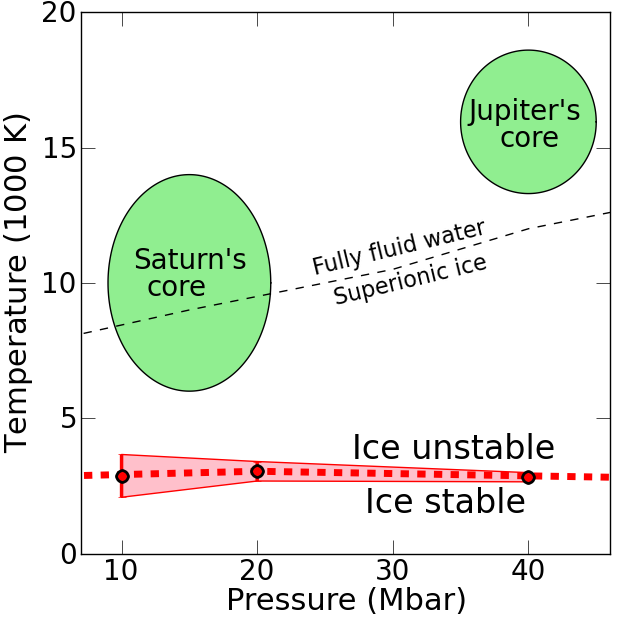 With ab initio simulations, Hugh Wilson and I demonstrate in our recent manuscript that water ice is not thermodynamically stable at the temperature and pressure conditions where core is exposed to the layer of metallic hydrogen above. This implies that the cores in Jupiter and Saturn have been eroded over time, with the icy material being redistributed convectively throughout the planet. Our work has implications for constraining the interior structure and evolution of giant planets and will be relevant for the interpretation of data from NASA's Juno mission to Jupiter (to be launched in August 2011). Core erosion could also provide a significant flux of heavy elements to the atmosphere of exoplanets and may explain why some of them have significantly inflated radii. 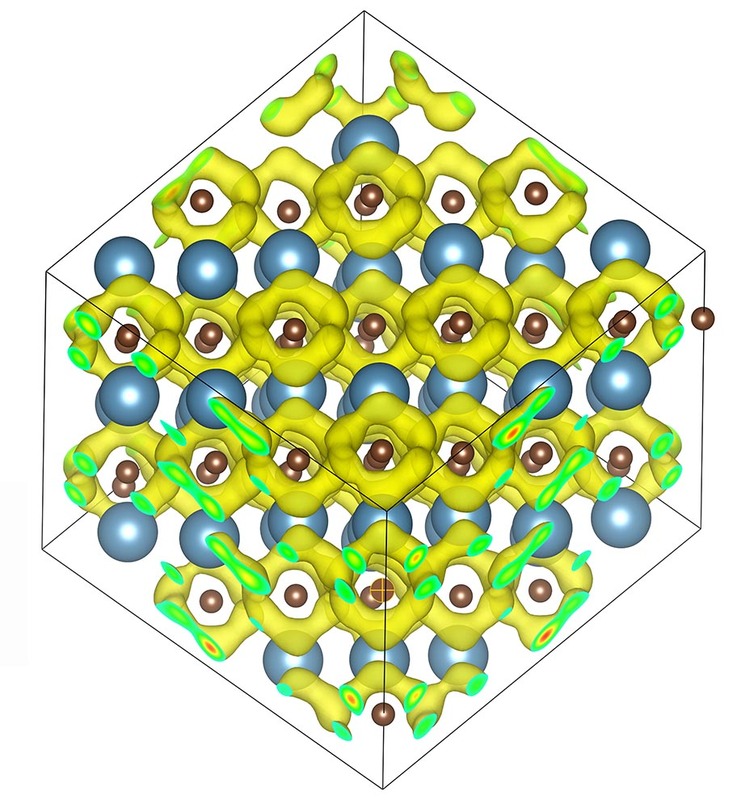 4) our new Cmcm structure that is metallic and predicted to occur at 15.5 Mbar. 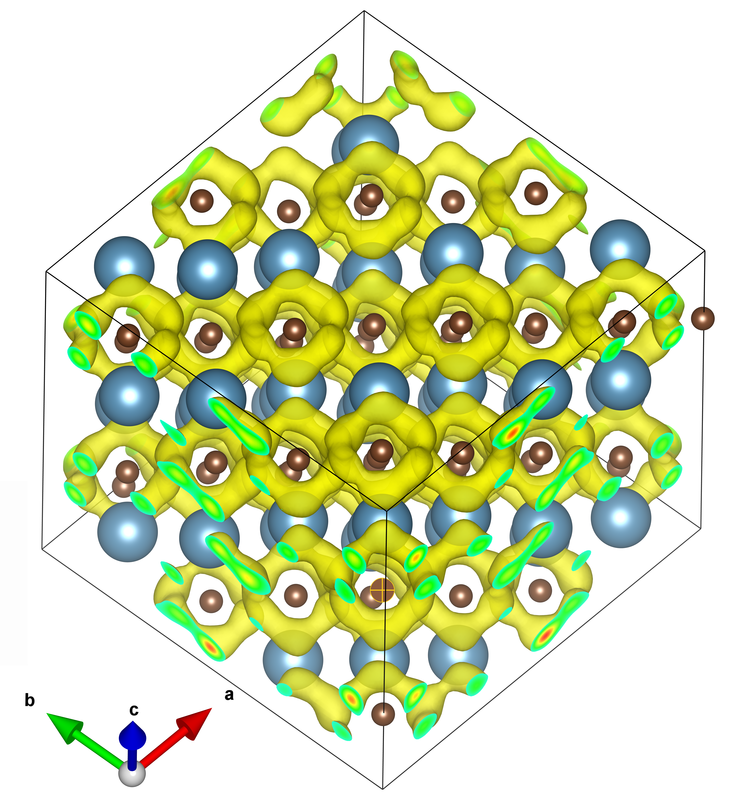 The known high pressure ice phases VII, VIII, X and Pbcm as well as our Pbca phase are all insulating and composed of two interpenetrating hydrogen bonded networks, but the Cmcm structure is metallic and consists of corrugated sheets of H and O atoms. The H atoms are squeezed into octahedral positions between next-nearest O atoms while they occupy tetrahedral positions between nearest O atoms in the ice X, Pbcm, and Pbca phases. Jupiter’s interior. 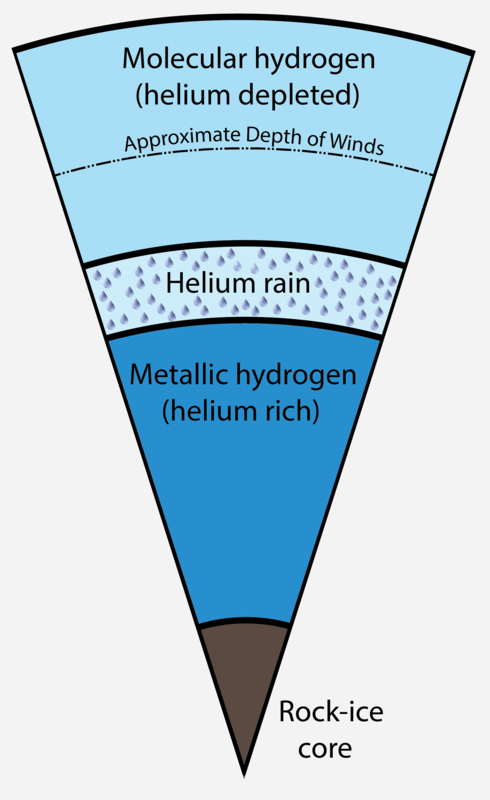 Helium rain occurs in the immiscibility layer and depletes the upper layer of both helium and neon. When the Galileo entry probe entered Jupiter's atmosphere in 1995, it measured that the inert gas neon was depleted by a factor of 10 compared to the composition of sun, which represents the concentrations in nebula that formed our solar system with all its eight planets. So where is all the neon gone that was present in Jupiter initially? Using ab initio computer simulations Hugh Wilson and I link the missing neon to another process that was proposed to occur inside Jupiter: helium rain. 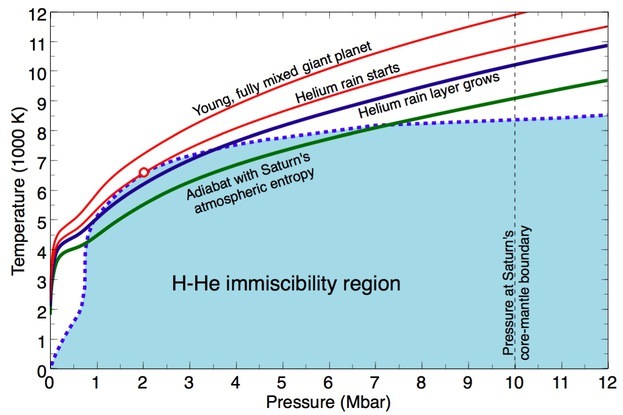 There is indirect evidence from luminosity measurements that helium rain occurs on Saturn but it was unclear whether it occurs inside Jupiter also. 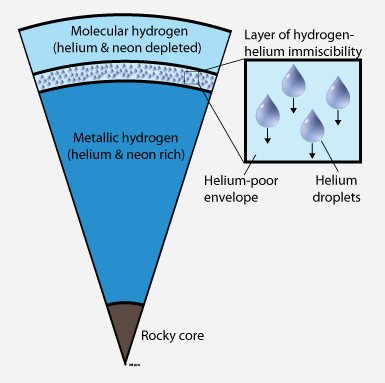 Our calculations now show that neon preferentially dissolves into helium droplets and it is therefore gradually sequestered into the deeper interior as the helium rain falls. The remaining hydrogen-rich envelope is slowly depleted of both neon and helium. The measured concentrations of both elements agree quantitatively with our calculations. Read commentary by J. Fortney "Peering into Jupiter", UC Berkeley's press release, Discovery Channel and LA Times articles. Insulator-to-Metal Transition in Solid Helium at High Pressure Metallic solid helium is present in the outer layers of White Dwarf stars. The cooling rate of White Dwarfs is regulated by the heat flow from the hot interior to the colder exterior. The insulator-to-metal transition is of interest because it marks the point where heat transport switches from electronic conductions to photon diffusion. In our paper, the insulator-to-metal transition in solid helium at high pressure is studied with different first-principles simulations. 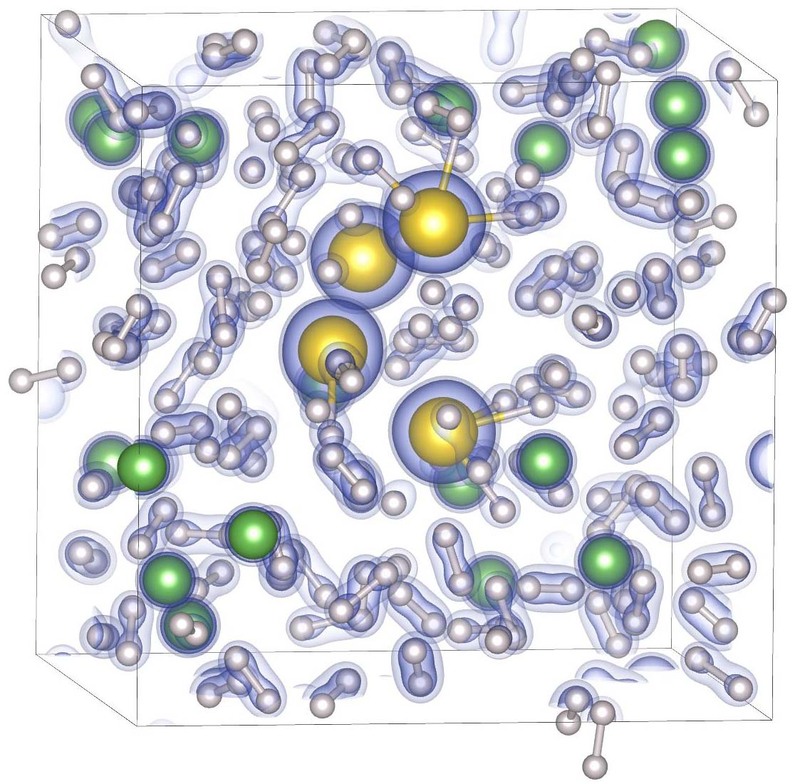 Diffusion quantum Monte Carlo (QMC) calculations predict that the band gap closes at a density of 21.3 g/cc and a pressure of 25.7 terapascals, which is 20% higher in density and 40 higher in pressure than predicted by standard density functional calculations. The metallization density derived from GW calculations is found to be in very close agreement with QMC predictions. Path integral Monte Carlo calculations showed that the zero-point motion of the nuclei has no significant effect on the metallization transition. We performed density functional molecular dynamics simulation to characterize hydrogen-helium mixtures in the interior of solar and extrasolar giant planets. In this article, we address outstanding questions about their structure and evolution e.g. whether Jupiter has a rocky core and if it was formed by a core accretion process. We describe how the presence of helium defers the molecular-to-metallic transition in hydrogen to higher pressures by stabilizing hydrogen molecules. 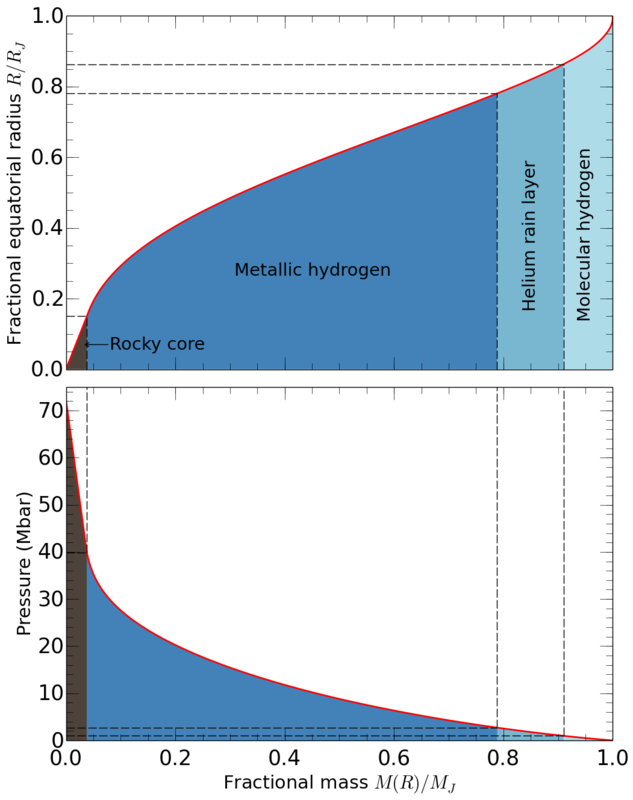 Shock hugoniot curves for precompressed hydrogen and helium. Shock wave experiments allow one to study a material's properties at high pressure and temperature. 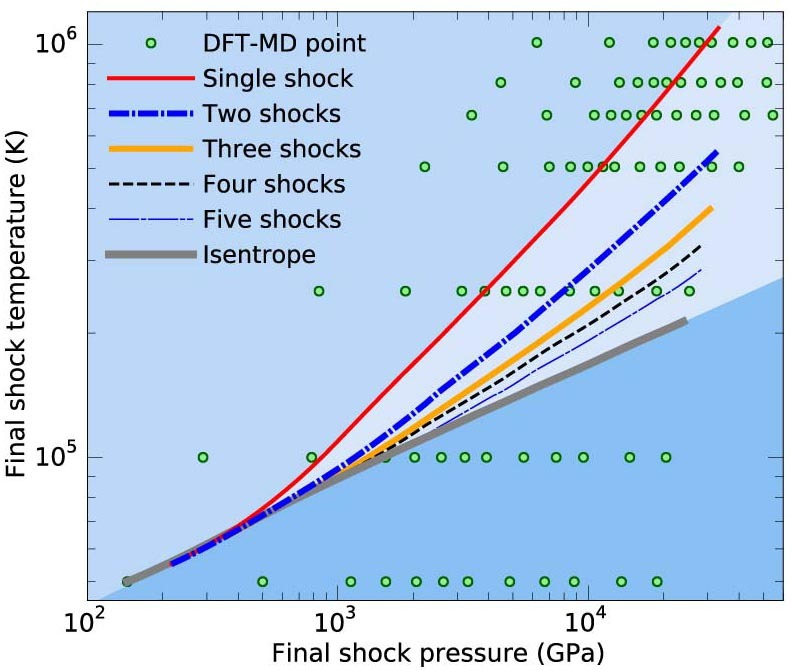 In this article (accepted for publication in Physical Review Letters), we used first-principles computer simulation to predict the properties of shock fluid helium at megabar pressures. 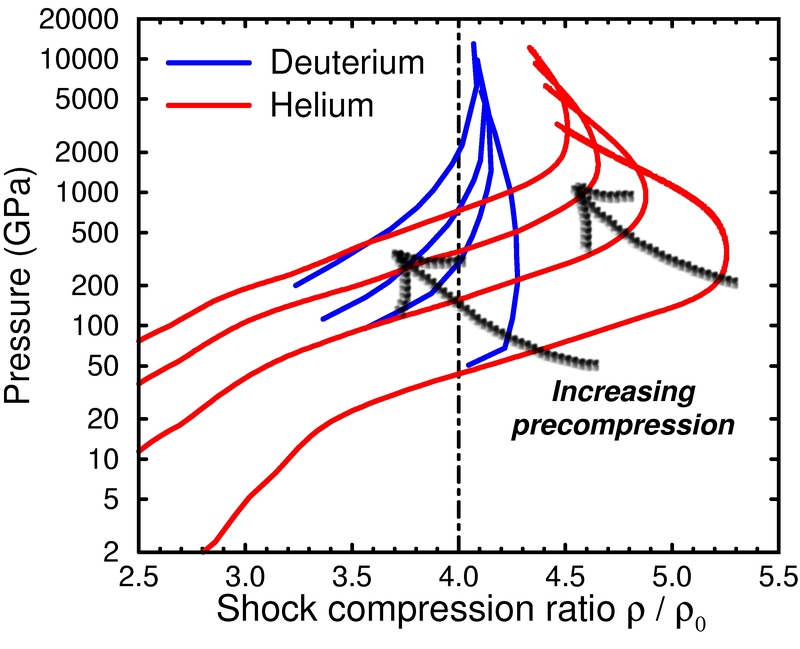 The simulations show that the compressibility of helium is substantially increased by electronic excitations. 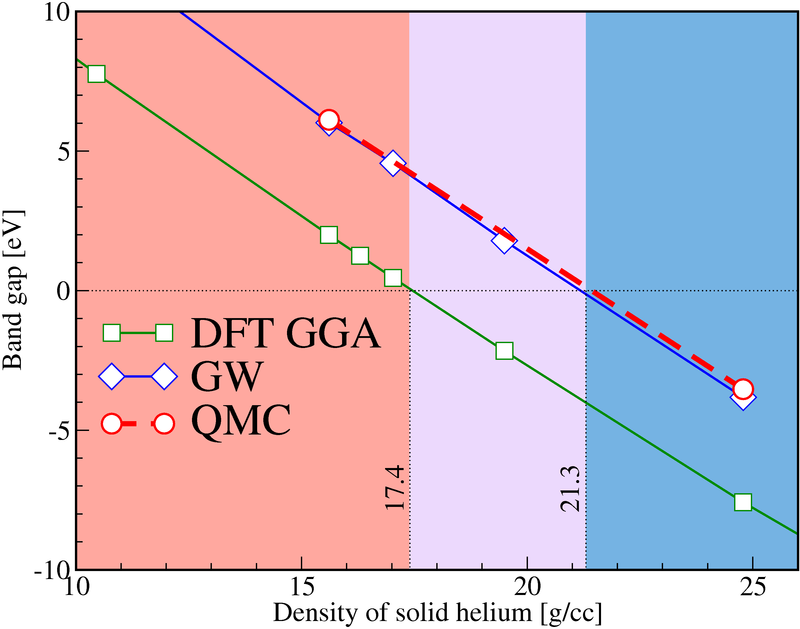 A maximum compression ratio of 5.24-fold the initial density was predicted for 360 GPa and 150000 K. This result distinguishes helium from deuterium, for which simulations predicted a maximum compression ratio of 4.3. If the sample are precompressed statically the compression ratio is reduced, which is shown in the left graph. Spin fluctuations present molecular oxygen (left) are suppressed at high pressures (right). In recent shock wave experiments [Phys. Rev. Lett. 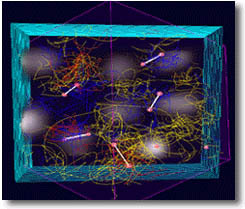 86, 3108 (2001)], the conductivity of liquid oxygen was measured for pressures up to 1.8 Mbar and indications for a insulator-metal transition were found. In this article, we report results from density functional molecular dynamics simulations of dense liquid oxygen close to the metal-insulator transition. We have found that band gap closure occurs in the molecular liquid, with a slow transition from a semi-conducting to a poor metallic state occurring over a wide pressure range. At approximately 80 GPa, molecular dissociation is observed in the metallic fluid. Spin fluctuations play a key role in determining the electronic structure of the low pressure fluid, while they are suppressed at high pressure. Many-body enhancement of nuclear reaction rates h(0) as function of the coupling parameter. Dense plasma effects can cause an exponenial change in charge particle nuclear reaction rates important in stellar evolution. In this article, reaction rates in dense plasmas are examined using path integral Monte Carlo. Quantum effects causes a reduction in the many body enhancement of the reaction rate, h(0), compared to the classical value. This is shown in figure on the left for different quantum parameters. This reduction can be attributed to the "quantum smearing" of the Coulomb interaction at the short range resulting in a reduced repulsion between the reacting pair and surrounding particles. Temperature density region of kinetic energy lowering for dense hydrogen and the electron gas. The equilibrium momentum distribution is of fundamental importance to characterize many-body systems. In contrast to classical systems where the distribution is always Maxwellian, in quantum systems the distribution depends on particle statistics, bosons or fermions, as well as on interactions and can display interparticle correlations, which are the basis of superfluidity and superconductivity. In this article, we report and explain a surprising effect of interactions in quantum systems on the one particle momentum distribution and kinetic energy. Interactions never lower the ground state kinetic energy of a quantum system. However, at nonzero temperature, where the system occupies a thermal distribution of states, interactions can reduce the kinetic energy below the noninteracting value. This is demonstrated using PIMC simulations for dense hydrogen and the electron gas. At which pressure and density does hydrogen become metallic? At low densities up to about rs=2.6, the properties of hydrogen including the equation of state are well understood. 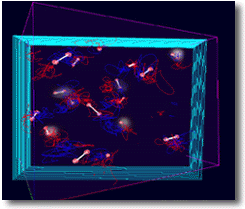 Processes like the thermal dissociation of molecules can be modelled accurately with PIMC. The resulting proton-proton pair correlation functions are shown. 110. S. Zhang, A. Lazicki, B. Militzer, L. H. Yang, K. Caspersen, J. A. Gaffney, M. W. Däne, J. E. Pask, W. R. Johnson, A. Sharma, P. Suryanarayana, D. D. Johnson, A. V. Smirnov, P. A. Sterne, D. Erskine, R. A. London, F. Coppari, D. Swift, J. Nilsen, A. J. Nelson, H. D. Whitley, "Equation of state of warm-dense boron nitride combining computation, modeling, and experiment", Phys. Rev. B 99 (2019) 165103. Available on the arXiv. 109. L. Iess, B. Militzer, Y. Kaspi, P. Nicholson, D. Durante, P. Racioppa, A. Anabtawi, E. Galanti, W. Hubbard, M. J. Mariani, P. Tortora, S. Wahl, M. Zannoni, "Measurement and implications of Saturn's gravity field and ring mass", Science 17 Jan 2019:eaat2965. DOI: 10.1126/science.aat2965. 108. B. Militzer, E. L. Pollock, D. Ceperley, "Path Integral Monte Carlo Calculation of the Momentum Distribution of the Homogeneous Electron Gas at Finite Temperature", J. High Energy Density Physics 30 (2019) 13-20. 107. R. Domingos, K. M. Shaik, B. Militzer, "Prediction of Novel High Pressure H2O-NaCl and Carbon Oxide Compounds with Symmetry-Driven Structure Search Algorithm", Phys. Rev. B 98 (2018) 174107. Also available on the arXiv. 106. F. Soubiran, B. Miltzer, "Electrical conductivity and magnetic dynamos in magma oceans of Super-Earths", Nature Communications 9 (2018) 3883. 105. S. Zhang, B. Militzer, M. C. Gregor, K. Caspersen, L. H. Yang, T. Ogitsu, D. Swift, A. Lazicki, D. Erskine, R. A. London, P. M. Celliers, J. Nilsen, P. A. Sterne, and H. D. Whitley "Theoretical and experimental investigation of the equation of state of boron plasmas", Phys. Rev. E 98 (2018) 023205, available on the arXiv. 104. K. P. Driver, F. Soubiran, B. Militzer, "Path integral Monte Carlo simulations of hot, dense aluminum", Physical Review E 97 (2018) 063207. 103. L. Iess, W. M. Folkner, D. Durante, M. Parisi, Y. Kaspi, E. Galanti, T. Guillot, W. B. Hubbard, D. J. Stevenson, J. D. Anderson, D. R. Buccino, L. Gomez Casajus, A. Milani, R. Park, P. Racioppa, D. Serra, P. Tortora, M. Zannoni, H. Cao, R. Helled, J. I. Lunine, Y. Miguel, B. Militzer, S. Wahl, J. E. P. Connerney, S. M. Levin, S. J. Bolton, "Measurement of Jupiter's asymmetric gravity field", Nature 555 (2018) 220. 102. Y. Kaspi, E. Galanti, W. B. Hubbard, D. J. Stevenson, S. J. Bolton, L. Iess, T. Guillot, J. Bloxham, J. E. P. Connerney, H. Cao, D. Durante, W. M. Folkner, R. Helled, A. P. Ingersoll, S. M. Levin, J. I. Lunine, Y. Miguel, B. Militzer, M. Parisi, S. M. Wahl "Jupiter's atmospheric jet streams extend thousands of kilometres deep", Nature 555 (2018) 223. 101. T. Guillot, Y. Miguel, B. Militzer, W. B. Hubbard, Y. Kaspi, E. Galanti, H. Cao, R. Helled, S. M. Wahl, L. Iess, W. M. Folkner, D. J. Stevenson, J. I. Lunine, D. R. Reese, A. Biekman, M. Parisi, D. Durante, J. E. P. Connerney, S. M. Levin & S. J. Bolton, "A suppression of differential rotation in Jupiter's deep interior", Nature 555 (2018) 227. 100. B. Militzer, S. Zhang, "Ab initio Simulations of Superionic H2O, H2O2, and H9O4 Compounds", AIP conference proceedings 1979 (2018) 050012. Also available on the arXiv. 99. S. Zhang, B. Militzer, L. X. Benedict, F. Soubiran, K. P. Driver, P. A. Sterne, "Path integral Monte Carlo simulations of dense carbon-hydrogen plasmas", J. Chem. Phys. 148 (2018) 102318. Also available on the arXiv. 98. Y. Kaspi, T. Guillot, E. Galanti, Y. Miguel, R. Helled, W. B. Hubbard, B. Militzer, S. M. Wahl, S. Levin, J. E. P. Connerney, S. J. Bolton, "The effect of differential rotation on Jupiter's low-degree even gravity moments", Geophysical Research Letters 44 (2017) 5960, doi:10.1002/2017GL073629. 97. S. Zhang, K. P. Driver, F. Soubiran, B. Militzer "First-principles Equation of State and Shock Compression Predictions of Warm Dense Hydrocarbons", Phys. Rev. E 96 (2017) 013204. 96. 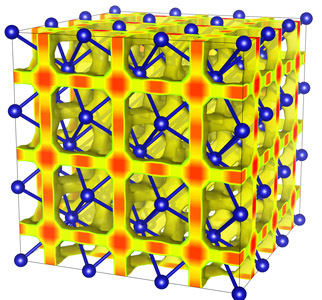 K. P. Driver, B. Militzer, "First-principles simulations of warm dense lithium fluoride", Phys. Rev. E 95 (2017) 043205. Also availalbe on the arXiv. 95. S. M. Wahl, W. B. Hubbard, B. Militzer, T. Guillot, Y. Miguel, Y. Kaspi, R. Helled, D. Reese, N. Movshovitz, E. Galanti, S. Levin, J.E. Connerney, S.J. Bolton, "Comparing Jupiter interior structure models to Juno gravity measurements and the role of a dilute core", Geophysical Research Letters 44 (2017) 4649, doi:10.1002/2017GL073160. 94. K. P. Driver, F. Soubiran, S. Zhang, B. Militzer, "Comparison of Path Integral Monte Carlo Simulations of Helium, Carbon, Nitrogen, Oxygen, Water, Neon, and Silicon Plasmas", J. High Energy Density Physics 23 (2017) 81. 93. F. Soubiran, B. Militzer, K. P. Driver, S. Zhang, "Properties of hydrogen, helium, and silicon dioxide mixtures in giant planet interiors", Physics of Plasmas 24 (2017) 041401. Also available on the arXiv. 92. S. Zhang, K. P. Driver, F. Soubiran, B. Militzer, "Equation of state and shock compression of warm dense sodium - A first-principle study", J. Chem. Phys. 146 (2017) 074505. Also available on the arXiv. 91. T. Leonhardi, B. Militzer, "Ab initio simulations of liquid carbon monoxide at high pressure", J. High Energy Density Physics 22 (2017) 41. 90. Z. Li, J. Li, L. Rebecca, J. Liu, B. Militzer, "Determination of calcium carbonate and sodium carbonate melting curves up to Earth's transition zone pressures with implications for the deep carbon cycle", Earth and Planetary Science Letters 457 (2017) 395. 89. S. Zhang, K. P. Driver, F. Soubiran, B. Militzer, "Path Integral Monte Carlo Simulations of Warm Dense Sodium", J. High Energy Density Physics 21 (2016) 16. 88. B. Militzer, "Supercell Design for First-Principles Simulations of Solids and Application to Diamond, Silica, and Superionic Water", J. High Energy Density Physics 21 (2016) 8. 87. 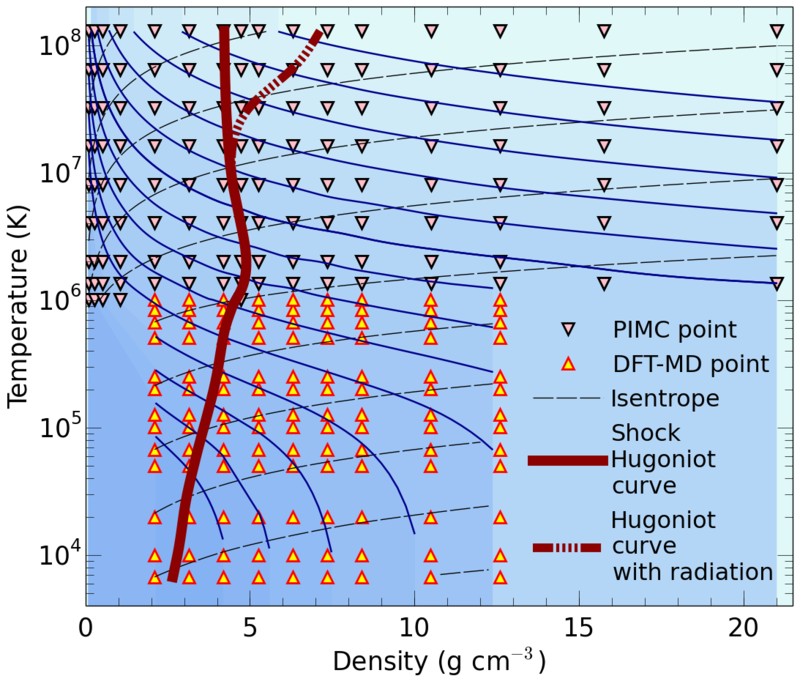 S. X. Hu, B. Militzer, L. A. Collins, K. P. Driver, and J. D. Kress, "First-Principles Prediction of the Softening of the Silicon Shock Hugoniot Curve", Phys. Rev. B 94 (2016) 094109. Also available on the arXiv. 86. B. Militzer, F. Soubiran, S. M. Wahl, W. Hubbard, "Understanding Jupiter's Interior", J. Geophysical Research, 121 (2016) 1552. Also available on the arXiv. 85. S. M. Wahl, W. B. Hubbard, B. Militzer, "Tidal response of preliminary Jupiter model", Astrophysical J. 831 (2016) 14. Also available on the arXiv. 84. F. Soubiran, B. Militzer, "The properties of heavy elements in giant planet envelopes", Astrophysical J. 829 (2016) 14. Also available on the arXiv. 83. B. Militzer, "Computation of the High Temperature Coulomb Density Matrix in Periodic Boundary Conditions", Computer Physics Communications 204 (2016) 88. Also available on the arXiv. 82. S. M. Wahl, W. B. Hubbard, B. Militzer, "The Concentric Maclaurin Spheroid method with tides and a rotational enhancement of Saturn's tidal response", Icarus 282 (2017) 183. Also available on the arXiv. 81. W. B. Hubbard, B. Militzer, "A preliminary Jupiter model", Astrophysical Journal 820 (2016) 80. Also available on the arXiv. 80. 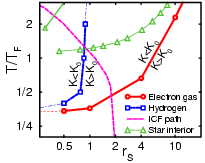 K. P. Driver, B. Militzer, "First-Principles Equation of State Calculations of Warm Dense Nitrogen", Phys. Rev. B 93 (2016) 064101. 79. S. Zhang, S. Cottaar, T. Liu, S. Stackhouse, B. Militzer, "High-pressure, temperature elasticity of Fe- and Al-bearing MgSiO3: implications for the Earth's lower mantle", Earth and Planetary Science Letters 434 (2016) 264. 78. B. Militzer, K. P Driver, "Development of Path Integral Monte Carlo Simulations with Localized Nodal Surfaces for Second-Row Elements", Phys. Rev. Lett. 115 (2015) 176403. 77. K. P. Driver, F. Soubiran, Shuai Zhang, and B. Militzer "First-principles equation of state and electronic properties of warm dense oxygen", J. Chem. Phys. 143 (2015) 164507. 76. F. Soubiran, B. Militzer, "Miscibility calculations for water and hydrogen in giant planets", Astrophys. J. 806 (2015) 228. 75. S. X. Hu, V. N. Goncharov, T. R. Boehly, R. L. McCrory, S. Skupsky, L. A. Collins, J. D. Kress, B. Militzer, "Impact of First-Principles Properties of Deuterium-Tritium on Inertial Confinement Fusion Target Designs", Physics of Plasmas 22 (2015) 056304. 74. F. Soubiran, B. Militzer, "Hydrogen-Water Mixtures in Giant Planet Interiors Studied with Ab Initio Simulations", J. High Energy Density Physics 17 (2015) 157. 73. K. Driver, B. Militzer, "First-principles simulations and shock Hugoniot calculations of warm dense neon", Phys. Rev. B 91 (2015) 045103. 72. S. Wahl, B. Militzer, "High-temperature miscibility of iron and rock during terrestrial planet formation", Earth and Planetary Science Letters 410 (2015) 25. 71. Y. Lin, R. E. Cohen, S. Stackhouse, K. P. Driver, B. Militzer, L. Shulenburger and J. Kim, "Equations of state and stability of MgSiO3 perovskite and post-perovskite phases from quantum Monte Carlo simulations", Phys. Rev. B 90 (2014) 184103, available on the archive. 70. H. F. Wilson, B. Militzer, "Interior phase transformations and mass-radius relationships of silicon-carbon planets", Astrophys. J. 973 (2014) 34. 69. F. Gonzalez-Cataldo, H. F. Wilson, B. Militzer, "Solubility of silica in metallic hydrogen: implications for the stability of rocky cores in giant planets", Astrophys. J. 787 (2014) 79. 68. P. Kaercher, B. Militzer, H.-R. Wenk, "Ab initio calculatios of elastic constants in plagioclase feldspars", American Mineralogist 99 (2014) 2344. 67. L. X. Benedict, K. P. Driver, S. Hamel, B. Militzer, T. Qi, A. A. Correa, A. Saul, E. Schwegler, "A multiphase equation of state for carbon addressing high pressures and temperatures", Phys. Rev. B 89 (2014) 224109, available on cond-mat. 66. S. M. Wahl, H. F. Wilson, B. Militzer, "Solubility of iron in metallic hydrogen and stability of dense cores in giant planets", Astrophysical Journal 773 (2013) 95, available on astro-ph. 65. B. Militzer, W. B. Hubbard, "Ab Initio Equation of State for Hydrogen-Helium Mixtures with Recalibration of the Giant-Planet Mass-Radius Relation", Astrophysical Journal 774 (2013) 148, available on astro-ph. 64. 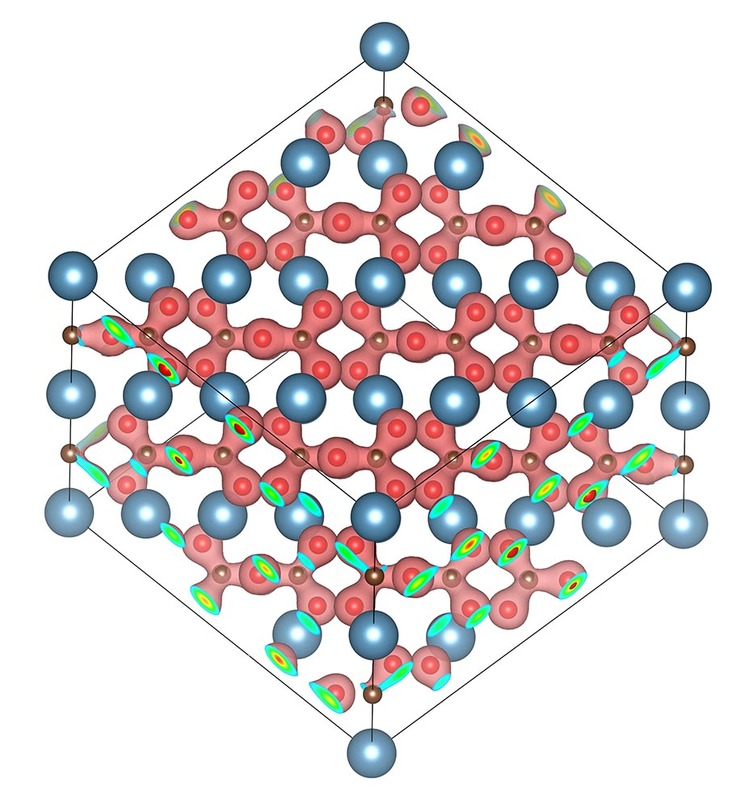 B. K. Godwal, S. Stackhouse, J. Yan, S. Speziale, B. Militzer, R. Jeanloz, "Co-Determination of Crystal Structures at High Pressure: Combined Application of Theory and Experiment to the Intermetallic Compound AuGa2", Phys. Rev. B Rapid Comm. 87 (2013) 100101. 63. B. Militzer, "Equation of state calculations of hydrogen-helium mixtures in solar and extrasolar giant planets", Physical Review B 87 (2013) 014202. 62. 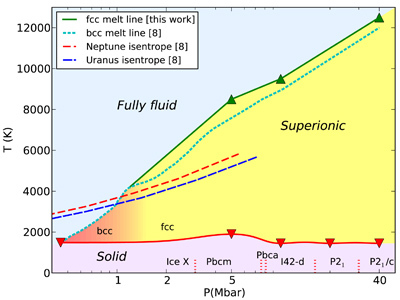 H. F. Wilson, M. L. Wong, B. Militzer, "Superionic to superionic phase change in water: consequences for the interiors of Uranus and Neptune", Physical Review Letters 110 (2013) 151102, also available on astro-ph. 61. 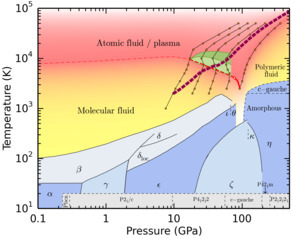 S. Zhang, H. F. Wilson, K. P. Driver, B. Militzer, "H4O and other hydrogen-oxygen compounds at giant-planet core pressures", Physical Review B 87 (2013) 024112, also available on condmat. 60. B. L. Sherman, H. F. Wilson, D. Weeraratne, and B. Militzer, "Ab Initio Simulations of Hot, Dense Methane During Shock Experiments", Physical Review B 86 (2012) 224113, also available on condmat. 59. B. Militzer, "Ab Initio Investigation of a Possible Liquid-Liquid Phase Transition in MgSiO3 at Megabar Pressures", Journal of High Energy Density Physics 9 (2013) 152, available also on condmat. 58. K. P. Driver, B. Militzer, "All-Electron Path Integral Monte Carlo Simulations of Warm Dense Matter: Application to Water and Carbon Plasmas", Phys. Rev. Lett. 108 (2012) 115502. 57. H. F. Wilson, B. Militzer, "Rocky core solubility in Jupiter and giant exoplanets", Phys. Rev. Lett. 108 (2012) 111101. Suggested read by PRL editor. Also available on astro-ph. 56. 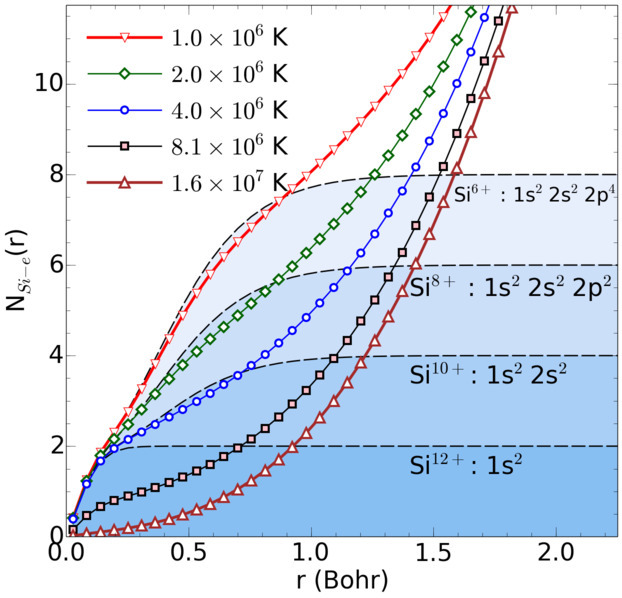 S. X. Hu, B. Militzer, V. N. Goncharov, and S. Skupsky, "FPEOS: A First-Principles Equation of State Table of Deuterium for Inertial Confinement Fusion Applications", Phys. Rev. B, 84 (2011) 224109, also available on cond-mat. 55. H. F. Wilson, B. Militzer, "Solubility of water ice in metallic hydrogen: consequences for core erosion in gas giant planets", Astrophys. J. 745 (2012) 54, also available on astro-ph. 54. B. Militzer, "Bonding and Electronic Properties of Ice at High Pressure", Intern. J. Quantum Chemistry 112 (2011) 314, also available on cond-mat. 53. L. Miyagi, W. Kanitpanyacharoen, S. Stackhouse, B. Militzer, H.-R. Wenk, "The Enigma of Post-Perovskite Anisotropy: Deformation versus Transformation Textures", Physics and Chemistry of Minerals 38 (2011) 665, DOI: 10.1007/10.1007/s00269-011-0439-y. 52. 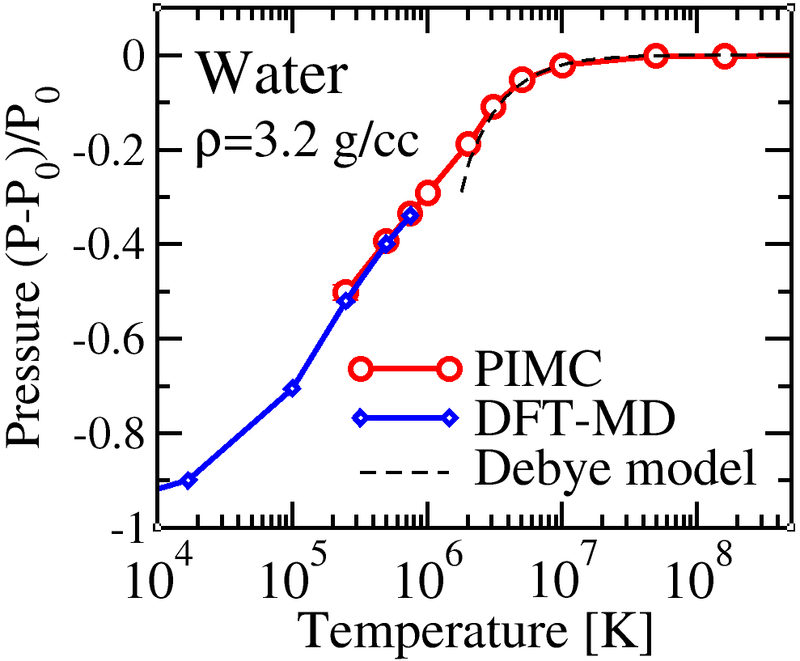 B. Militzer, H. F. Wilson, "New Phases of Water Ice Predicted at Megabar Pressures", Phys. Rev. Lett. 105 (2010) 195701, available on cond-mat. 51. S. X. Hu, B. Militzer, V. N. Goncharov, and S. Skupsky, "Strong-Coupling and Degeneracy Effects in Inertial Confinement Fusion Implosions", Phys. Rev. Lett. 104 (2010) 235003. 50. B. Militzer, H.-R. Wenk, S. Stackhouse, and L. Stixrude, "First-Principles Calculation of the Elastic Moduli of Sheet Silicates and their Application to Shale Anisotropy", American Mineralogist 96 (2011) 125. 49. A. R. Rhoden, B. Militzer, E. M. Huff, T. A. Hurford, M. Manga, and M. A. Richards, "Constraints on Europa's rotational dynamics from modeling of tidally-driven fractures", Icarus 210 (2010) 770. 48. H. F. Wilson and B. Militzer, "Sequestration of noble gases in giant planet interiors", Phys. Rev. Lett. 104 (2010) 121101. Read commentary by J. Fortney "Peering into Jupiter" in Physics 3 (2010) 26, UC Berkeley's press release, Discovery Channel and LA Times articles. 47. K. P. Esler, R. E. Cohen, B. Militzer, J. Kim, R.J. Needs, and M.D. Towler, "Fundamental high pressure calibration from all-electron quantum Monte Carlo calculations", Phys. Rev. Lett. 104 (2010) 185702. 46. K. P. Driver, R. E. Cohen, Z. Wu, B. Militzer, P. Lopez Rios, M. D. Towler, R. J. Needs, and J. W. Wilkins "Quantum Monte Carlo for minerals at high pressures: Phase stability, equations of state, and elasticity of silica", Proc. Nat. Acad. Sci. 107 (2010) 9519. 45. P. Beck, A.F. Goncharov, J. A. Montoya, V.V. Struzhkin, B. Militzer, R.J. Hemley, and H.-K. Mao, ''Response to “Comment on ‘Measurement of thermal diffusivity at high-pressure using a transient heating technique’”'', Appl. Phys. Lett. 95 (2009) 096101. 44. J. J. Fortney, I. Baraffe, B. Militzer, chapter "Interior Structure and Thermal Evolution of Giant Planets", in "Exoplanets", ed. S. Seager, Arizona Space Science series (2009). 43. B. Militzer, "Correlations in Hot Dense Helium", J Phys. A 42 (2009) 214001, cond-mat/09024281. 42. J. J. Fortney, S. H. Glenzer, M. Koenig, B. Militzer, D. Saumon, and D. Valencia, "Frontiers of the Physics of Dense Plasmas and Planetary Interiors: Experiment, Theory, Applications", Physics of Plasmas 16 (2008) 041003. 41. B. Militzer and W. B. Hubbard, "Comparison of Jupiter Interior Models Derived from First-Principles Simulations", Astrophysics and Space Science 322 (2009) 129, astro-ph/08074266. 40. S. A. Khairallah and B. Militzer, "First-Principles Studies of the Metallization and the Equation of State of Solid Helium", Phys. Rev. Lett. 101 (2008) 106407, physics/08054433. 39. B. Militzer, "Path Integral Monte Carlo and Density Functional Molecular Dynamics Simulations of Hot, Dense Helium", Phys. Rev. B 79 (2009) 155105, cond-mat/08050317. 38. B. Militzer, W. B. Hubbard, J. Vorberger, I. Tamblyn, and S.A. Bonev, "A Massive Core in Jupiter Predicted From First-Principles Simulations", Astrophysical Journal Letters 688 (2008) L45, astro-ph/08074264. 37. P. Beck, A. F. Goncharov, V. Struzhkin, B. Militzer, H.-K. Mao, and R. J. Hemley "Measurement of thermal diffusivity at high pressure using a transient heating technique", Appl. Phys. Lett. 91 (2007) 181914. 36. B. Militzer, W. B. Hubbard, "Implications of Shock Wave Experiments with Precompressed Materials for Giant Planet Interiors", AIP conference proceedings 955 (2007) 1395. 35. J. Vorberger, I. Tamblyn, S.A. Bonev, B. Militzer, "Properties of Dense Fluid Hydrogen and Helium in Giant Gas Planets", Contrib. Plasma Phys. 47 (2007) 375. 34. S. Seager, M. Kuchner, C. A. Hier-Majumder, B. Militzer, "Mass-radius relationship of solid exoplanets", Astrophys. J. 669 (2007) 1279. 33. 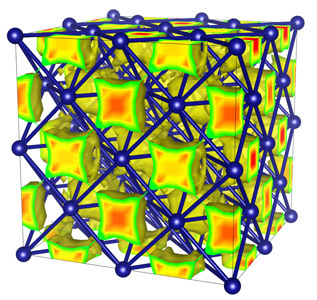 V. V. Struzhkin, B. Militzer, W. Mao, R. J. Hemley, H.-k. Mao, "Hydrogen Storage in Clathrates", Chem. Rev. 107 (2007) 4133. 32. G. D. Cody, H. Yabuta, T. Araki, L. D. Kilcoyne, C. M. Alexander, H. Ade, P. Dera, M. Fogel, B. Militzer, B. O. Mysen, "An Organic thermometer for Chondritic Parent Bodies", Earth. Planet. Sci. Lett. 272 (2008) 446. 31. J. Vorberger, I. Tamblyn, B. Militzer, S.A. Bonev, "Hydrogen-Helium Mixtures in the Interiors of Giant Planets", Phys. Rev. B 75 (2007) 024206, cond-mat/0609476. 30. B. Militzer, R. J Hemley, "Solid oxygen takes shape", Nature (News & Views), 443 (2006) 150. 29. B. Militzer, "First Principles Calculations of Shock Compressed Fluid Helium", Phys. Rev. Lett. 97 (2006) 175501. 28. B. Militzer, R. L. Graham, "Simulations of Dense Atomic Hydrogen in the Wigner Crystal Phase", J. Phys. Chem. Solids, 67 (2006) 2136. 27. B. Militzer, "Hydrogen-Helium Mixtures at High Pressure", J. Low Temp. Phys. 139 (2005) 739. 26. 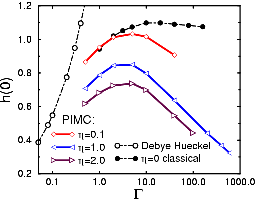 B. Militzer, E. L. Pollock, "Equilibrium Contact Probabilities in Dense Plasmas", Phys. Rev. B, 71 (2005) 134303. 25. J.-F. Lin, B. Militzer, V. V. Struzhkin, E. Gregoryanz, R. J. Hemley, H.-k. Mao, "High Pressure-Temperature Raman Measurements of H2O Melting to 22 GPa and 900 K", J. Chem. Phys. 121 (2004) 8423. 24. 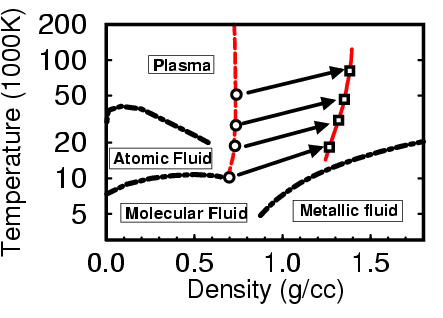 E. L. Pollock, B. Militzer, "Dense Plasma Effects on Nuclear Reaction Rates", Phys. Rev. Lett. 92 (2004) 021101. 23. S. A. Bonev, B. Militzer, G. Galli, "Dense liquid deuterium: Ab initio simulation of states obtained in gas gun shock wave experiments", Phys. Rev. B 69 (2004) 014101. 22. F. Brglez, X.Y. Li, M.F. Stallmann, and B. Militzer, "Evolutionary and Alternative Algorithms: Reliable Cost Predictions for Finding Optimal Solutions to the LABS Problem", Information Sciences, in press, 2004. 21. 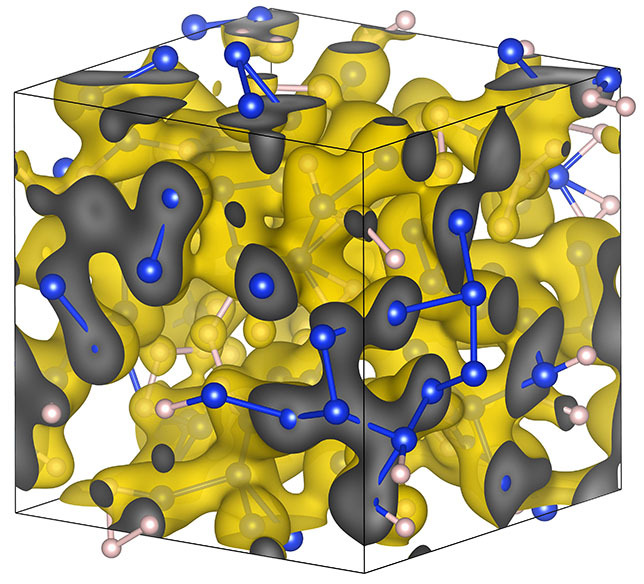 B. Militzer, F. Gygi, G. Galli, "Structure and Bonding of Dense Liquid Oxygen from First Principles Simulations", Phys. Rev. Lett. 91 (2003) 265503. 20. F. Brglez, X.Y. Li, M.F. Stallmann, and B. Militzer, "Reliable Cost Predictions for Finding Optimal Solutions to LABS Problem: Evolutionary and Alternative Algorithms", Proceedings of The Fifth International Workshop on Frontiers in Evolutionary Algorithms, Cary, NC (2003). 19. B. Militzer, "Path Integral Calculation of Shock Hugoniot Curves of Precompressed Liquid Deuterium", J. Phys. A: Math. Gen. 63 (2003) 6159. 18. B. Militzer, E. L. Pollock, "Lowering of the Kinetic Energy in Interacting Quantum Systems", Phys. Rev. Lett. 89 (2002) 280401. 17. B. Militzer, D. M. Ceperley, J. D. Kress, J. D. Johnson, L. A. Collins, S. Mazevet, "Calculation of a Deuterium Double Shock Hugoniot from Ab Initio Simulations", Phys. Rev. Lett. 87 (2001) 275502. 16. B. Militzer, D. M. Ceperley, "Path Integral Monte Carlo Simulation of the Low-Density Hydrogen Plasma", Phys. Rev. E 63 (2001) 066404. 15. B. Militzer, D. M. Ceperley, "Path Integral Monte Carlo Calculation of the Deuterium Hugoniot", Phys. Rev. Lett. 85 (2000) 1890. 14. B. Militzer, "Path Integral Monte Carlo Simulations of Hot Dense Hydrogen", Ph.D. thesis, University of Illinois at Urbana-Champaign (2000). 13. B. Militzer, E. L. Pollock, "Variational Density Matrix Method for Warm Condensed Matter and Application to Dense Hydrogen", Phys. Rev. E 61 (2000) 3470. 12. B. Militzer, E. L. Pollock, "Introduction to the Variational Density Matrix Method and its Application to Dense Hydrogen", in Strongly Coupled Coulomb Systems 99, ed. by C. Deutsch, B. Jancovici, and M.-M. Gombert, J. Phys. France IV 10 (2000) 315. 11. B. Militzer, W. Magro, and D. Ceperley, "Characterization of the State of Hydrogen at High Temperature and Density", Contr. Plasma Physics 39 (1999) 1-2, 151. 10. W. Magro, B. Militzer, D. Ceperley, B. Bernu, and C. Pierleoni, "Restricted Path Integral Monte Carlo Calculations of Hot, Dense Hydrogen", in Strongly Coupled Coulomb Systems, ed. by G. J. Kalman, J. M. Rommel and K. Blagoev, Plenum Press, New York NY, 1998. 9. W. Ebeling, B. Militzer, and F. Schautz, "Quasi-Classical Theory and Simulation of Two-Component Plasmas", in Strongly Coupled Coulomb Systems, ed. by G. J. Kalman, J. M. Rommel and K. Blagoev, Plenum Press, New York NY, 1998. 8. B. Militzer, W. Magro, and D. Ceperley, "Fermionic Path-Integral Simulation of Dense Hydrogen", in Strongly Coupled Coulomb Systems, ed. by G. J. Kalman, J. M. Rommel and K. Blagoev, Plenum Press, New York NY, 1998. 7. B. Militzer, M. Zamparelli, and D. Beule, "Evolutionary Search for Low Autocorrelated Binary Sequences", IEEE Trans. Evol. Comput. 2 (1998) 34-39. 6. W. Ebeling, B. Militzer, and F. Schautz, "Quasi-classical Theory and Simulations of Hydrogen-like Quantum Plasmas", Contr. Plasma Physics 37 (1997) 2-3, 137. 4. B. Militzer, "Quanten-Molekular-Dynamik mit reaktiven Freiheitsgraden", in Dynamik, Evolution, Strukturen, ed. J. Freund, Dr. Köster publishing company, Berlin, 1996. 2. B.-D. Dörfel and B. Militzer, "Test of Modular Invariance for Finite XXZ Chains", J. Phys. A: Math. Gen. 26 (1993) 4875. 1. A. Richter, G. Kessler, and B. Militzer, "Growth-kinectics of thin-films deposited by laser ablation", 473-478, in Laser Treatment of Materials, ed. by Barry L. Mordike, Oberursel : DGM Informationsgesellschaft, 1992. 1994-1996 Diploma in physics in Prof. Ebeling's group at the Humboldt University at Berlin.